In his first sit-down interview as the new Senate majority whip, Texas' senior senator said President Obama isn't engaged, Harry Reid is an obstructionist and Ted Cruz and he disagree over tactics, not ideology. WASHINGTON, D.C. — For several years now, the most powerful Texan in Washington has been the Senate’s No. 2 Republican, U.S. Sen. John Cornyn. When Republicans took control of the Senate on Tuesday, he became even more so. That gig is to ensure that his party has enough votes to pass legislation. But often in history, whips have played the bad cops and arm twisters among party leaders. Cornyn’s approach is to focus less on the stick and the carrot – he says earmarks are a thing of the past. Instead, he aims to build on relationships developed over the years with fellow Republican senators, most notably during his two terms as chairman of Senate Republican campaign arm from 2009 to 2013. But as he counts votes, he will also contend with three dominant figures at this point in his political life: President Obama, Senate Minority Leader Harry Reid of Nevada and fellow Texas Republican Sen. Ted Cruz. Looking ahead to the next term, his legislative focus will be on human trafficking and criminal justice and prison reform. And energy is on his mind. Like most Republicans, he considers the Keystone pipeline a top agenda item. But he placed it as a small issue in historical context – and used it to illustrate his frustrations with Obama. “What I worry about the most is that we’re talking now about things like the Keystone XL pipeline which are important, but it’s not like passing the Civil Rights Act of 1964,” he said. He aired a frequent Obama complaint from Capitol Hill. When asked if Obama has ever personally called him to lobby for legislation, Cornyn paused for a moment. The other Democrat who raised Cornyn’s hackles is Reid. Cornyn complained that Reid's six-year tenure did not allow for the open airing and debate of legislation. He promised that he and Senate Majority Leader Mitch McConnell of Kentucky will take a different approach. “I think there’s high hopes that while we expect the first few weeks to be a little bumpy that I think there’ll be bipartisan appreciation for the opportunity to actually participate in the legislative process,” he said. “It’s been a pretty miserable experience,” he added. But the real intrigue for Cornyn observers has nothing to do with national Democrats. It’s Cornyn’s relationship with the junior senator from Texas. As the whip, Cornyn is a part of the very Republican establishment that Cruz often upended during his first two years in office. Cruz did not endorse Cornyn for re-election last cycle until after the senior senator won the party nomination. 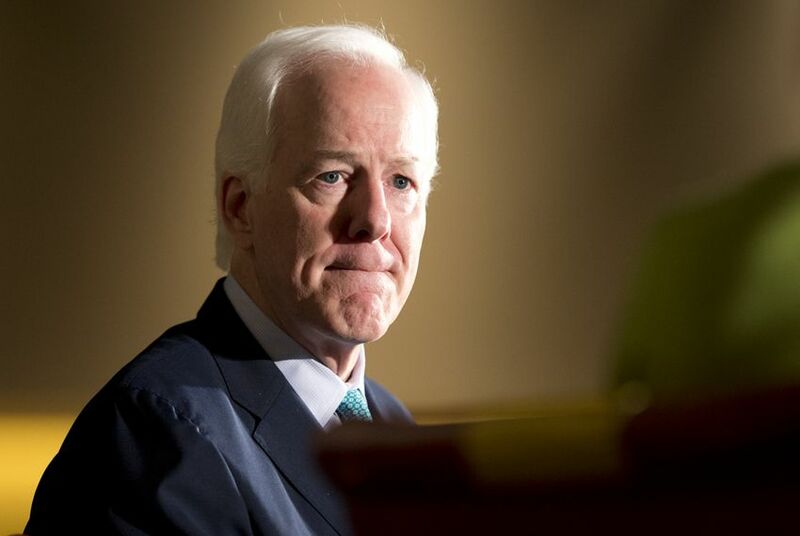 Cornyn redirected any perceived conflict with Cruz toward Reid. “All of us have been enormously frustrated by being in the minority and by Harry Reid not allowing us to do our job and to represent our states,” he said. “That’s going to be different, he added. “I think that it will be an enormous relief valve for pressure that’s been built up over the last few years." Cruz, who is posturing for a 2016 presidential run, will not be receiving Cornyn’s endorsement in a GOP primary. That’s because no GOP primary candidate will — Cornyn pledged to stay out of the presidential primaries. As for their relationship, Cornyn stressed that their differences are over tactics, not ideology. “It’s important to Texas, it’s important to me, and I think it’s important to Sen. Cruz that we work together and try to do everything that we can for the people that sent us here,” Cornyn said of their relationship. “And I think we will." Correction: This story originally included incorrect information about Harry Reid. He is the minority leader of the Senate, not the House.